State and local taxes in Minnesota typically grow over time in response to increased consumption and rising economic activity, and to keep pace with the growing demand for public services. There is one notable exception to this rule: the currently frozen state business property tax. Because this tax is frozen, the cost of government shifts to other taxpayers that are not lucky enough to have such a sweet deal. The state business property tax was created in 2002. Prior to passage of the 2017 special session tax act, the state business property tax levy was adjusted annually based on the rate of inflation. * Even this was a good deal for Minnesota businesses, since it insulated the state levy from the effects of general population growth, increased demands for health care spending due to the state’s aging population, and other factors which push public expenses upward. As a result, the state business property tax steadily declined in real (i.e., inflation-adjusted) dollars per capita since its inception. The especially sharp drop in the state business property tax levy from 2017 to 2018 was due to the exemption of the first $100,000 of property value from the state levy. After 2018, the nominal state business property tax levy will remain frozen. Because inflation and population growth will continue, the decline in the state levy in real per capita dollars will almost certainly accelerate. For example, from 2002 to 2017, the state business property tax in real per capita dollars declined at an average annual rate of 1.0 percent. As a result of the freeze, the real per capita levy will decline at an annual average rate of 3.7 percent from 2018 to 2025, based on projected rates of inflation and population growth. 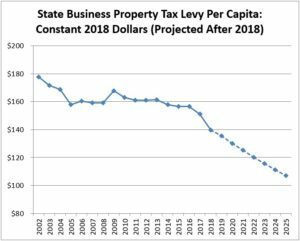 While the real per capita state business property tax levy has declined over time, the rate of the tax (i.e., the levy divided by the statewide business tax base) has varied due to fluctuation in business values. However, the rate trends downward. In 2018 the rate of the state business property tax hit an all-time low of 43.9%. From 2002 to 2018, the state business property tax rate declined by nearly a quarter. 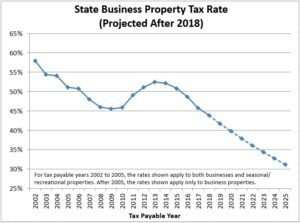 If we assume that statewide business values continue to grow at the same rate as they have in recent years (about 5% annually), the state business property tax rate will continue to plunge to new all-time lows in each succeeding year. During the era when the state business property tax levy was adjusted for inflation, it was insulated from the effects of state aid cuts and other pressures that were pushing local property taxes upward. Partly because a large share of the property taxes paid by businesses was protected from these other spending pressures, total property taxes paid by businesses have grown much less rapidly than that of homeowners and owners of other residential properties since 2002. For example, from 2002 to 2017, real per capita property taxes paid by all classes of residential property† increased by approximately 30%, while real per capita business property taxes increased by only 1%. For business properties, growth in real per capita local property taxes was offset by the drop in real per capita state property taxes. The stark difference in the rate of property tax growth between residential and business properties is not due to differences in the rate of value growth, since the aggregate value growth from 2002 to 2017 is approximately the same for both categories of property. While the state business property tax is not the only reason for the relatively flat level of real per capita business property taxes over the last fifteen years,‡ it is a major contributor. Note that the low rate of business property tax growth relative to residential property from 2002 to 2017 occurred while the state business property tax was allowed to grow at the rate of inflation. Now that the levy is frozen, businesses have an additional advantage relative to other classes of property. According to the Council on State Taxation’s fifty state business tax report, the share of total state and local taxes paid by Minnesota businesses is below the national average. Again, these findings from fiscal year 2015 were made while the state business property tax was adjusted annually for inflation. With the state business levy frozen, an even larger share of total Minnesota taxes will shift from businesses to Minnesota families. *Specifically, the state business property tax was adjusted annually based on the change in the Implicit Price Deflator for State & Local Government Purchases (S&L IPD). All inflation adjustments in this article are based on the S&L IPD, since it is the appropriate index to use when adjusting general fund expenditures for the effects of inflation. †Here “residential properties” is broadly defined to include all class of properties in which people reside, including residential and agricultural homestead properties, residential non-homestead properties, and apartments. “Residential property taxes” as used here refers to the net tax, after subtracting the renters’ property tax refund (PTR) and the homeowners’ PTR/homestead credit refund. ‡Other reasons for the low rate of growth in business property taxes vis-à-vis homestead property taxes include the rapid growth in school referendum market value levies, which we describe in a recent North Star article.